It was the sort of thing you might see in a comedy: the husband, slightly daft, is taken advantage of by a sharper who sells him a bit of beachfront property in a prime location for what seems to be an impossibly low price, especially for more than three thousand square feet with an ocean view. He keeps it secret from his wife, telling her instead he has a surprise for her and to keep her questions to herself. “All will be revealed in time,” said with a sly and knowing smile. And then, of course, the punchline. The address on the direction leads to a small shack hardly the size of an outhouse. It is constructed of thick concrete block set with an iron door. “At least the key works,” the husband says uneasily, turning the great lock with creaking difficulty. A set of steps leads down to a tunnel rimed with salt and damp as any tomb, ancient conduit dull with rust running along the ceiling with the occasional dim bulb every dozen feet or so. 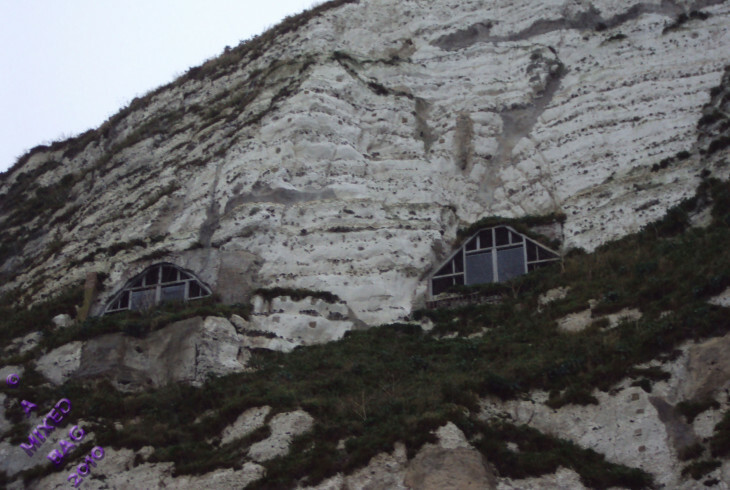 The deeded property as written is for one of the old war fortifications at St. Margaret’s Bay on the South Foreland coast, a glassless machine gun emplacement jutting out over the sea itself, the naked gales howling through it like an enormous flute. “A coat of paint and a couple windows installed will do wonders,” he says in a voice utterly devoid of conviction. No wonder it was cheap :-) I think his wife well ban him from spending in the future! Hmmm. Yes, wife might not be so happy. It would be expensive, but it would be interesting to see how a designer could make this space livable. if that’s possible. It could be an HGTV thing. Great story. Now, getting it up to code, *that* will take a little longer. ;-) Sounds like a worthwhile challenge for a DIYer — and maybe worth it for the view!